Hello Ladies! I love waking up and making a hot tin of muffins to have with my tea. Slather rich, creamy butter on that muffin and you have yourself a slice of heaven! 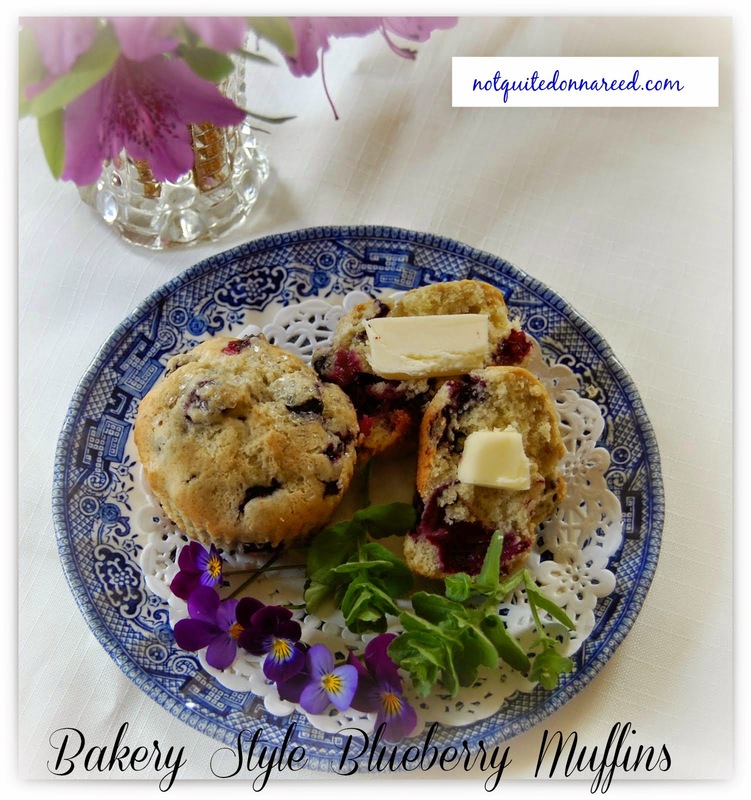 This is my go to blueberry muffin recipe. Since finding this one I have never made another-IT'S THAT GOOD! When I was a little girl I would often stay at my Aunt Sue's. She lived in the city and she loooooved to shop. We would hop the city bus, she didn't drive, and take it downtown to the big galleria where all sorts of shops were. Mid-afternoon we always stopped by Jordan Marsh Bakery and got some little sweet to go with a cup of tea or cocoa. Gave us the energy to keep shopping! Of course I was only 9, so I still had lots of energy, but that bakery had the best blueberry muffins and when I stumbled upon their recipe it brought back so many good memories of the times I spent with my Aunt. This was the early to mid seventies so I used to be in awe of all the well-dressed ladies shopping. Women got dolled up to go out back then! Bouffant hairdo's were still in too-how I loved those...LOL! Now I go to the store and all I see are flannel pajama bottoms and messy buns on ladies. Girls you gotta get dolled up before you leave the house! But that has nothing to do with muffins so let's jut get on to the recipe. I hope you enjoy them-they are delicious and they also pack and freeze well. Heat the oven to 375 degrees and line 24 muffin tins or grease 6 large Texas muffins. Cream together the butter sugar and eggs, whip til nice and fluffy. Add the dry ingredients to the cream mix alternating with the milk. So a little dry a little milk. Mix in the vanilla. Gently fold in the blueberries and bake for 25-30 minutes. You can sprinkle a bit of sugar on top before baking if you wish. *If using frozen blueberries toss in a bit of flour before you add them to the mix. Enjoy! *This recipe is linked up with Gooseberry Patches Recipe Round-up! I've been out of touch too long. These look so delicious. I wish we could have tea and muffins together sometime. Blessings! So nice to *see* you. If your ever in MA let me know I will make some for you put the kettle on! That would be fun.. I'd love that, but I live in Missouri. I'm not sure I'll ever make it that far. If I do though, I'll accept your invitation happily! If you come my way, the same's true. I've met a couple of other bloggers in person. It was fun. I'm so glad you are back. 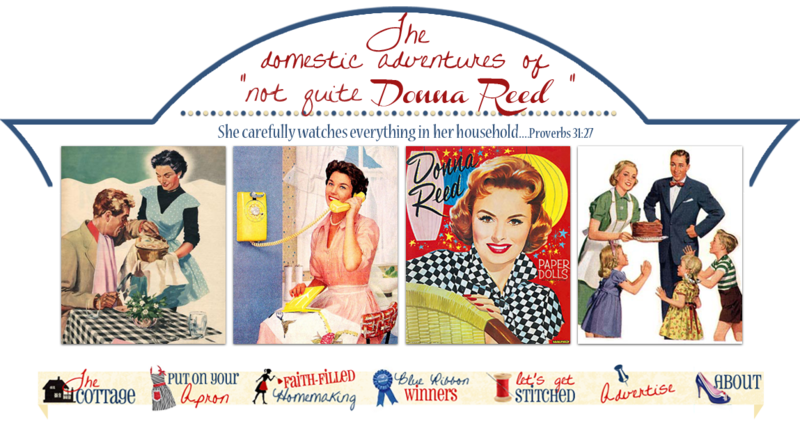 I, too , am a big fan of The Donna Reed Show and all the classic tv moms. Good ol' Jordan Marsh muffins. We had a tiny Jordan Marsh at the Methuen Mall and IIRC, they didn't have the muffins. If we wanted them, we'd have to go to the Jordan Marsh in Peabody at the North Shore Mall. Such a small world! Did you also shop at Jordan Marsh? Such a nice store in its day! Those muffins were the highlight of my trips-that and these little chocolate butter cookies with a cherry in the middle. Thanks for visiting-Donna is one of my favorites too. It was a big deal to go the one in Peabody about twice a year with my grandparents when I was a kid. We'd stop at the Pepperidge Farm thrift store along the way and Grandma would stock up on bread and cookies. No way would she pay full price at the supermarket so eating Pepperidge Farm products was a big treat. I remember I thought it was amazing that Jordan Marsh had a hair salon and a restaurant upstairs. I so wanted to eat lunch there as a little girl but never did. I didn't like blueberries as a child so I didn't try those muffins. I have a feeling I probably got some sort of cookie. My mother got her makeup at the drug store but Grandma got her stuff at the make up counters at Jordan's. I thought it was so glamorous watching the sales lady try products on her, just like how the rich people shop. lol And there'd be samples and/or a gift -with-purchase tucked in with her purchases, wow!